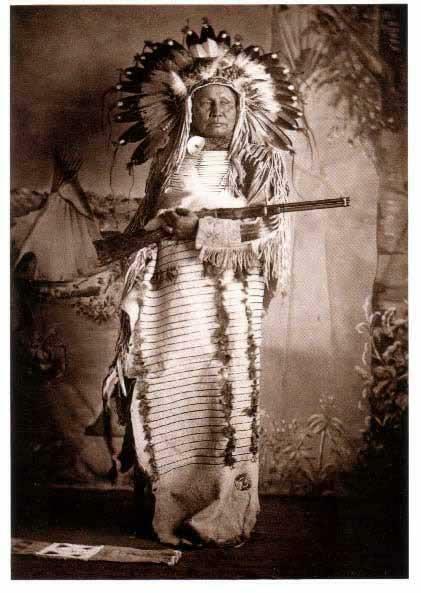 White Bear, a/k/a Tom Frosted, was a chief of the Lower Yanktonais at Standing Rock. He and his family is listed there in the 1876 census. The name Mato Ska/White Bear also appears in the 1885 records. There he is listed in Chief Eagle That Scares band of the Lower Yanktonais. Tom Frosted was photographed by Frank Fiske in 1901. Donovin Sprague stated in one of his books that he was a hereditary chief, so his father might very well been also a chief of the Lower Yanktonai. F.B. Fiske, E.D. Mossman, Chris Martineson, F.B. Zahn and Victor Zahn. The Indians have lost a man who was considered one of their foremost leaders in all matters concerning their welfare. The whites have lost a true friend among the red men. 1854: White Bear´s father was killed.